First Trailer for Tim Burton’s Frankenweenie. Charlie Tahan, Winona Ryder, Martin Short, Catherine O’Hara and Martin Landau voice the stop-motion animated comedy. 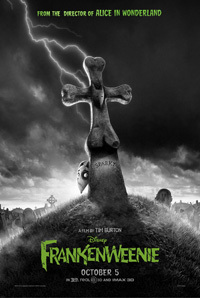 Watch the movie trailer for Frankenweenie below. Based on the 1984 short film by Tim Burton. Young Victor (Tahan) conducts a science experiment to bring his beloved dog Sparky back to life, only to face unintended, sometimes monstrous, consequences. Running Time: 1 hr. 27 min. MPAA Rating: (PG) for thematic elements, scary images and action. After unexpectedly losing his beloved dog Sparky, young Victor harnesses the power of science to bring his best friend back to life — with just a few minor adjustments. He tries to hide his home-sewn creation, but when Sparky gets out, Victor’s fellow students, teachers and the entire town all learn that getting a new “leash on life” can be monstrous.